In 1990 Kyoko Mori returned to her native Japan to visit the landscape of her childhood. There—looking for the house in which her mother killed herself, running on land that was once water, and retracing childhood train trips to her grandparents’ farm—she relived the memories and uncovered the secrets that unlocked her past. 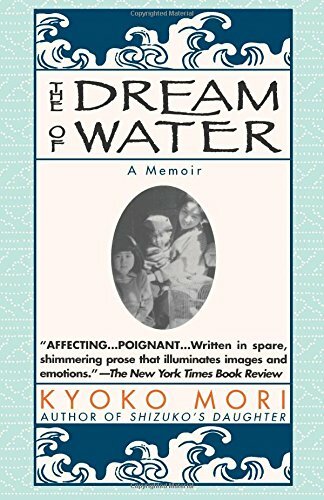 In The Dream of Water, a series of chapters that are themselves” small perfections,” she leads us to the “larger happiness” of an autobiography that is also a work of art. Japan is the land Mori fled as a teenager, seeking to escape from her cold, abusive father and her manipulative stepmother. It is the country she spent her adult life putting behind her, but it is also her homeland. As she searches through familiar neighborhoods and on distant islands, she is constantly aware of the culture she abandoned and the one she has adopted. Pushed by the sights and sounds of contemporary Japan into her interior world of memory and dreams, she also looks out toward the daylight land of America. A personal journey of discovery that is also an exploration of national difference, The Dream of Water explores intimate emotions that reveal profound cultural truths. Astonishingly beautiful: the chaste black strokes of a calligraphy that, by withholding, suggests more colors than color can achieve. Its lovely whorls describe the time she spends with her aunts, uncles, cousins, and grandmother; the harsh down strokes are the meeting with her father. Affecting . . . Poignant . . . Written in spare, shimmering proses that illuminates images and emotions. Poetic . . . remarkably honest . . . Mori describes her experiences with an admirable mixture of forthrightness and restraint. 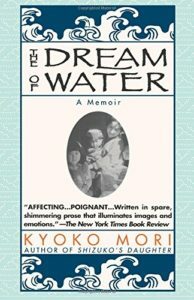 This entry was posted in Books, Dream of Water, Memoir, Nonfiction on September 20, 1996 by Kyoko.